On recommendation of a friend I recently visited the View Tube, an art gallery, bike hire centre, cafe and community education centre. It’s a wonder such a small place can be all those things at once, but the View Tube manages it. Located in a quiet corner of Stratford, just off the edge of the newly opened Olympic Park, the View Tube is probably not known to many outside the local area. This is a shame because it’s a fantastic little place with good food, good vibes and a range of free art installations. It might be hard to find, but it'll be worth it when you do. 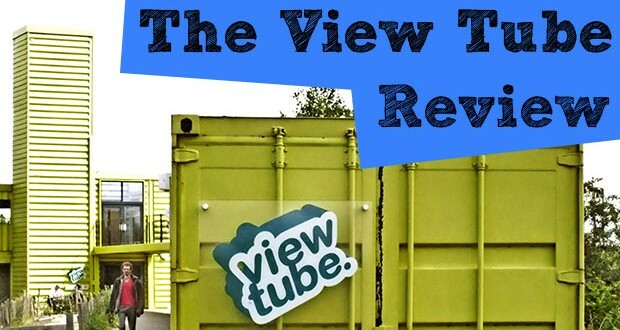 The View Tube has been constructed using recycled shipping containers giving it a temporary feel; however it was built on this site in 2011 and isn’t going anywhere soon. Having hosted dozens of events, educated hundreds of young people and showed off countless artworks from a range of people, both amateur and professional, the View Tube really is a little jewel tucked away in an annoyingly hard place to find. The best way to find the View Tube is to go to Pudding Mill lane DLR and follow the signs, or just look for a large lime green tower if you’re in the Olympic park. The first thing you will notice when walking down the pathway to the View Tube are the ‘rooms’ on the right hand side, each filled with an art exhibition or information on the rapidly changing area. There are around half a dozen of these rooms which form a free outdoor community gallery. During my visit I found it irresistible to explore each one in depth as every one of these small spaces has its own surprises. A working grand piano is the centre piece of what looks like a music themes room, this is followed by a huge information board showing the future of the Olympic park, then in the next room a small desk surrounded by colouring pens and a message book which has been filled out by previous visitors. It took me about 20 minutes before I actually reached the door of the cafe as I was so immersed in the oddity of some of the rooms, a well as the beauty of the art works on display in others. When I did finally arrive at the cafe, Mocha East, I was pleasantly surprised by what I found. Far from being the cold, rusty and dank space that its exterior portrays, the View Tube cafe is warm, welcoming and right on trend. With a formal dining area, a casual sofa area and outdoor seating, the cafe provides ample space to eat in a comfortable environment. The food on offer is the usual cafe affair, cakes, full English, Baguettes, Ciabatta etc, all of which create a delicious aroma which hits you as soon as you enter the cafe. The food on offer is all cooked/baked in house and seems to be of high quality, but the menu could do with some added variety. I become particularly ravenous as soon as the smell of bacon hit me so I went for the ‘Have it All Ciabatta’, a delicious mix of bacon, sausage, egg and mushroom. At a cost of £5.50 this wasn’t dirt cheap, but was probably under the average paid for quality food in London these days and when my food arrived I certainly wasn’t disappointed. My ciabatta tasted even better than it looks in that photo, and you have to admit it looks pretty good! If all there food is made to an equal standard then consider me a return customer in the near future! I was really surprised to find such an interesting little place in amongst all the massive developments happening in Stratford, but now that O have I’m sure to return and see some new exhibitions and try some more delicious food. If I have one gripe it’s that it’s so hard to find unless you are looking for it, which is a shame because I’m sure people would travel a few tube stops if they knew what they were missing! All this does make me wonder what other little gems are out there, better start exploring some more. Queen Elizabeth Olympic Park video review. Get up close to some historic artefacts at the top of The Shard!